Croatia has, since the turn of the century, become one of the most popular water sports destinations and the spell remains still unbroken. Water sports enthusiasts will find a very good maritime infrastructure, romantic bays, sleepy harbor towns and excellent restaurants in Croatia. A perfect fit for every taste. Around the turn of the century Croatia was on the international tourism market still a little spot. But that has changed dramatically. Even the nautical tourism plays a significant role. 1185 islands and islets run like a string of pearls along the coast. Many are bare and look like moon landscapes others are covered by lush green and fragrant bushes and pine forests. Croats have used the scenic beauty and created ideal conditions for water sports. 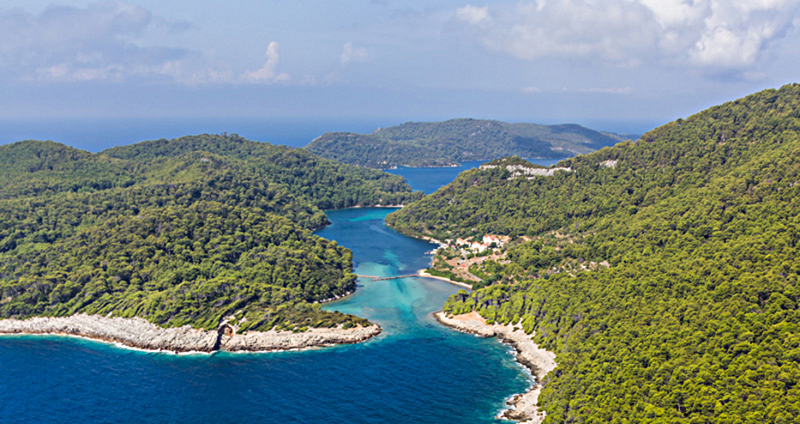 While in other countries progress is stagnated, much money has been invested in the expansion of existing and construction of new marinas in Croatia. Thus the country between Umag and Dubrovnik can now boast with almost 70 marinas and 340 harbors. They range from the marinas built on a small, barren rocky island as unique as ACI Marina Piškera to mega marinas such as the Marina Dalmatia in Sukošan. Charming are the many beautiful city ports such as Hvar, Korčula, Trogir, Supetar, Vodice, Primošten and a few more. Here, you dock - if you find a free berth - almost in the middle of the main market square and you can watch the world go by from the comfort of the cockpit. Due to the large demand for permanent and transit berths, the price level has increased significantly and is now partially on a similar level as in Italy or Spain. But one can also expect all the amenities of a modern marina. Due to the popularity of some ports it is often difficult even to get a free berth during the season. Early arrival and a little luck are needed. As an alternative to the well-developed ports and marinas there are buoy fields which free one from the spreading and burying the anchor. In no other Mediterranean area are as many buoy fields as in the Adriatic part. The authorities have issued licenses for the operation of large-scale buoy fields. The official buoy fields are all chargeable. Clean, anchored concrete blocks and well maintained moorings should be expected in return. Usually you can also dispose of its waste board here. Many buoys are taken by the restaurant owners to provide a secure anchorage for yachters. One often doesn’t have to pay fees. A visit to restaurant for dinner is expected of the crew in in return. Some buoy fields that are operated without a license can be problematic because they still charge fees. It can also sometimes come to disputes. Those who prefer to set up their own mooring can choose from nearly 1,000 berths. With our huge selection, something for every taste should be found here. In the nature and national parks and near some ports, anchoring is chargeable. Mooring operators, who collect in these areas, must identify themselves with a concession card. The name of the licensee, the number and data of anchorage must be listed. Without the official concession card, the operator should not require a fee. In Croatia are a vast number of beaches of fine and coarse gravel, stone or rock. The most famous Croatian beach is Zlatni Rat (the "Golden Horn”) on Brač Island. The top of the cape changes its direction depending on current and winds. But also some sandy beaches can be found. In Istria you can find this example in Premantura or in Baška on Krk Island. For yachters, the beach is very popular in Soline on Dugi Otok. You can also safely drop anchor here. Other sandy beaches are, for example, on the island Lopud near Dubrovnik, in and around town Split or even in the area near Vodice. Culturally interested sailors and power boaters will have a great time in Croatia. Istria attracts enthusiasts mainly with the urban centers of Poreč and Pula, and their millennia-old history. But the picturesque town of Rovinj attracts tourists from all over the world. Zadar is the metropolis of northern Dalmatia and attracts with its beautiful old town and many museums and cultural monuments. Split is an ancient ferry town with a vibrant commercial life even out of season, Trogir is situated on a picturesque island under a cathedral and many know of Dubrovnik as the Pearl of the Adriatic. This list only reflects a small part of the enormous wealth of historical and cultural interest again and could still expand significantly. Another reason why the center of the European watersports world has moved on the Adriatic Sea area in recent years is the Croatian gastronomy. On the coast, the Croatian cuisine is typically Mediterranean but marked by regional differences. Prosciutto, a dry-cured ham and Paski sir, a sheep's milk cheese from the island of Pag are typical and popular appetizers. Istrian Soup, olive oil and red wine soup with toasted pieces of bread, is a traditional specialty from Istria. The Istrian peninsula is also famous for its white truffles and oysters farmed in the Lim Channel. Very popular is the fish stew (Brodetto), a stew with various species of fish, tomatoes, onions and olive oil. The Peka is a dish made from lamb or veal meat that is cooked with various vegetables in a clay or iron bell in an open fire. Simply delicious. The Peka is also available with different types of fish. Whether by sail or motorboat, being an owner or charterer - in this delightful area you’ll have your money’s worth. Check out what you can discover in Croatia.